This new portrait of the bright star-forming region NGC 346, in which different wavelengths of light swirl together like watercolours, reveals new information about how stars form. This amazing space wallpaper of the bright star-forming region NGC 346, in which different wavelengths of light swirl together like watercolours, reveals new information about how stars form. NGC 346 is located 210,000 light-years away in the Small Magellanic Cloud, a neighbouring dwarf galaxy of the Milky Way. 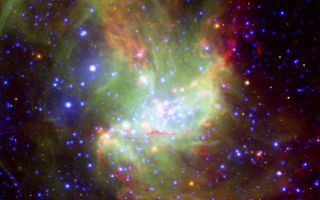 The image is based on data from ESA XMM-Newton (X-rays; blue), ESO's New Technology Telescope (visible light; green), and NASA's Spitzer (infrared; red). The infrared light shows cold dust, while the visible light denotes glowing gas, and the X-rays represent very hot gas. Ordinary stars appear as blue spots with white centres, while young stars enshrouded in dust appear as red spots with white centres.